The tragedy at Sandy Hook Elementary is igniting discussion and action for positive change in America. Display this Sandy Hook Elementary - In Our Hearts - 12.14.12 memorial ribbon magnet in school color green on your vehicle to remind people that our children and our security matter most. 10% of the profits from each ribbon magnet will be donated to: “Connecticut PTSA Sandy Hook Fund” to support the ongoing needs of the Sandy Hook Community. (Connecticut PTSA, 60 Connolly Parkway, Building 12, Suite 103, Hamden, CT 06514). The magnet itself is a 3.5" x 8" green and white ribbon design. This ribbon magnet is manufactured and printed in the USA on premium quality, thick (.030) magnetic material with UV protected inks. 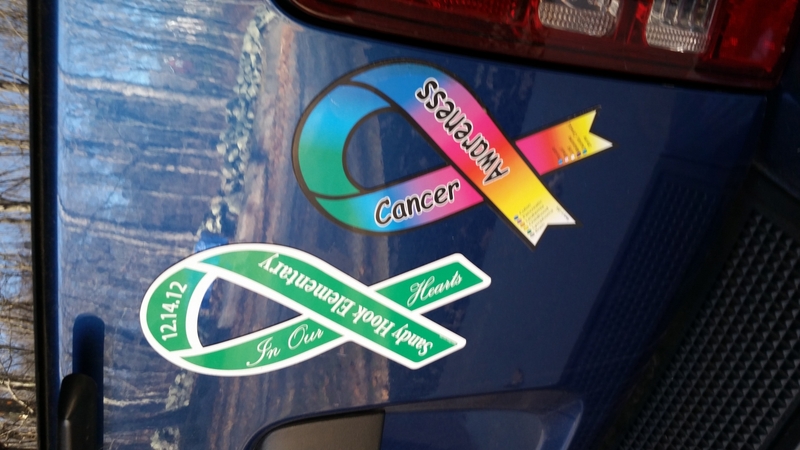 Purchasers of this ribbon magnet generated over $11,700.00 in donations to the Connecticut PTSA Sandy Hook Fund. If you are purchasing this ribbon magnet and would like to make an additional donation, please contact the Connecticut PTSA. I had discovered that my Sandy Hook magnet was not on my car anymore. I ordered 4 more so I will have them in case this happens again. This is an extremely important cause and I would have spent double if needed to. Merchant Response:Thank you for your review. We agree that this is an extremely important cause and we are honored to continue to offer this ribbon magnet so you and others can share your support for the Sandy Hook community. I have the magnets displayed on my car. I have purchased this item before. I think it is an important reminder to attach to our cars around the anniversary of this tragic occasion. I live in the next town over from Sandy Hook and couldn't find one of these magnets in any store. So I ordered from Support Store and the magnet was sent out the same day! I received it so quickly. I wished I had thought to order it months ago. It is a bittersweet feeling when I look at it on my car, but it helps me to remember to keep praying for those families. These magnets were perfect. They looked great on my car and were the perfect size. The only thing wrong is that someone stole the magnet off of my car! Shame on whomever did this. I will have to reorder another one.